Little House In Colorado: 31 Days To Organization - Day 30: Practice, Practice, Practice! 31 Days To Organization - Day 30: Practice, Practice, Practice! Happy New Year! January is a time to start fresh...to begin again with a fresh, clean start...so it is only appropriate that January is National Organization Month! And since many people make a New Year's resolution to become more organized, I've been posting organization tips every day during month of January. Missed a day? You can find them all HERE. There is no sense in de-cluttering your home or office only to have the clutter invade again and multiply. The goal here is to eliminate clutter and KEEP IT AWAY. But you have to practice, practice, practice. You will get better and better at it and it will become a habit. Junk mail is going to continue to show up in your mailbox. Broken and unwanted toys will still surface. Clothing will be outgrown. These things cannot be avoided. Use the de-cluttering skills you've learned to handle these problems. Never leave a room empty handed. Scan the room for items that belong elsewhere, then pick the item(s) up, take it to the correct room and put it away. This goes for laundry, dishes, books - anything and everything. Put those de-cluttering skills to use everyday, keeping clutter out of your home, your office and your life. Keep a large bin in a permanent location for donations. Every time you find something you no longer want, need, or that doesn't fit, add it to the bin. Make it part of your routine to take the bin weekly or monthly to the donations drop-off. 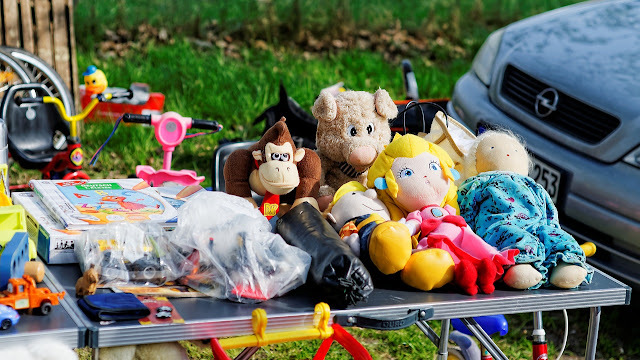 If you have the space, set everything aside that can be re-sold and earn some money from your junk by having a garage sale! Toss junk mail in the trash as soon as you get it. Don't let it pile up until you can "get around to it". Rip it up or shred it, then toss it. Scan your laundry as you fold it for items that needs repairs, pieces that can be donated or clothing that needs to be tossed. Likewise, if you try on something that doesn't fit, immediately put it in your donations or yard sale bin instead of back into your closet. Before you buy something new, ask yourself why you want it. Does it make you happy...really happy? Is there something else you could or should be spending your money on? Do you have a place in your home for it? Sometimes when shopping, I'll hold onto something the whole time I am in the store, keeping it in my cart until it's time to check out. Then I'll put it back without buying it. By then I have "owned it" long enough and can let it go. Weird, I know. But maybe it will work for someone else, too.